Wheel Clamps offer a visual aid to let would be thieves know its going to be rather difficult, to pinch you van. So the brighter colour they are the better. Hmm. I wonder if they make them with a glow in the dark paint job? I once owned a cheap wheel clamp, similar to the one below, and I was not impressed with it at all. NOW for my Reality Call. I forgot one day I had it clamped on the wheel of my caravan, and I started to drive off with it still attached to my van. This cheap lock, simply crumbled, and fell apart. So if you wanted to steal any van, or trailer using this cheap lock, you simply drive with it still attached to the wheel, and it will crumble and drop off. You will hardly notice it was attached, apart from a small bump while driving when it drops off. The only good thing about this heap of junk, is it did no damage to my caravan, not a single scratch. So needless to say, I have not bothered getting another cheap Chinese one to replace it. I may buy a better one later, but not really sure just yet. I do advise placing a cheap mobile phone with GPS hidden inside your van as additional security. There are several cheap mobile plans that last for one year, and if your caravan did get stolen there is a very good chance of tracking and finding it. Wheel Clamps are a Visual Aid, to let thieves know this will be harder to steal, as well as a physical Deterrent to the process of nicking your van or trailer. I strongly advise you based on my personal experience with a cheap wheel clamp. 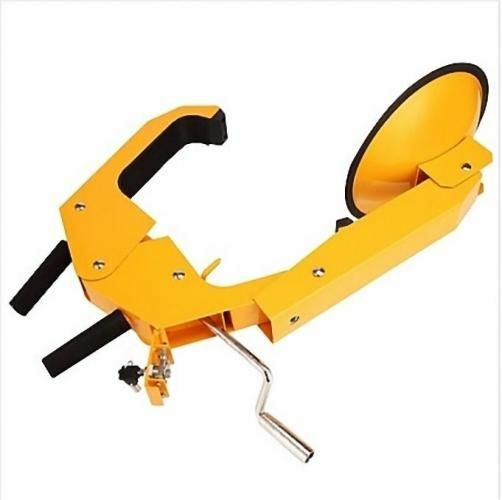 Save yourself a headache in the making: pay a bit more, and get a heavy duty wheel clamp, from a reputable manufacturer.